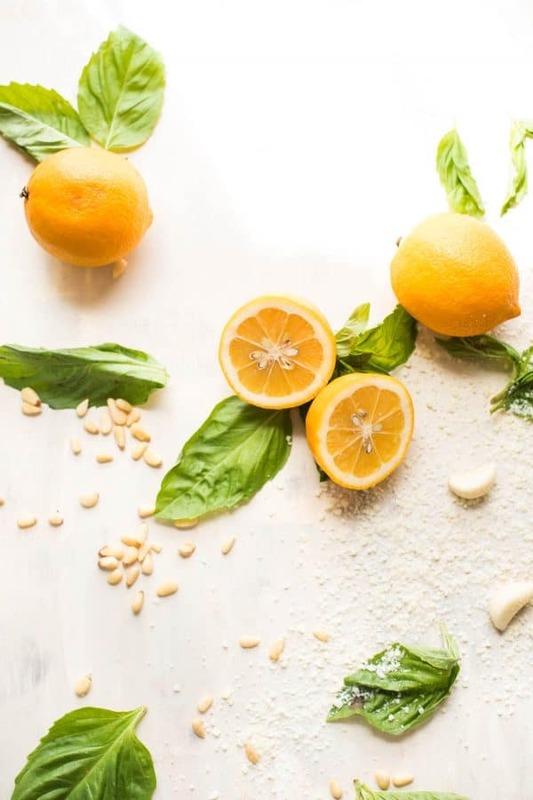 Meyer lemons…little sun kissed, tangy, sweet citrus that is here to totally up your pesto game. 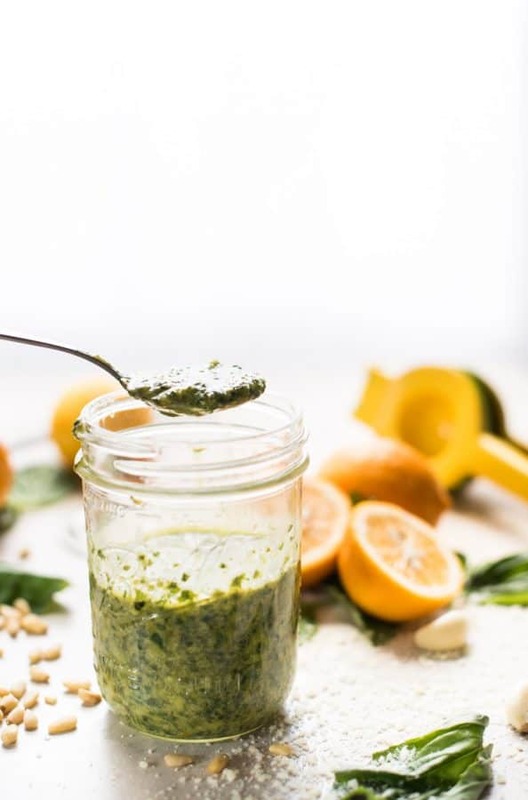 In this Meyer lemon basil pesto the zested skin and juice of the lemon is added to fresh picked basil leaves, spicy raw garlic, toasted pine nuts, rich olive oil, and salty Parmesan cheese. And we’re going to put it on all the things. No really. Here’s how it went down IRL. “Hey, I’m going to try this new pesto sauce with a piece of bread. Oh wow, that’s really yummy. Okay, maybe a little more bread.” Then while chewing on the last of the loaf I’m brainstorming how to put it on all of my food the rest of the day….caprese salads, quinoa, pasta, chicken or working it into this Lemon Ricotta Pesto Spaghetti. And just like that the day got 500x better. Sweeter than regular lemons but still with the familiar tang. Just not quite as acidic or bitter. 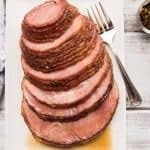 You could eat them as is, tossed with vinaigrettes, use in baking, sliced thin and roasted without worrying about a super bitter rind. You won’t be able to find them year round so it’s nice to have a little, special ‘treat yo’self’ ingredient. Can’t find Meyer lemons? 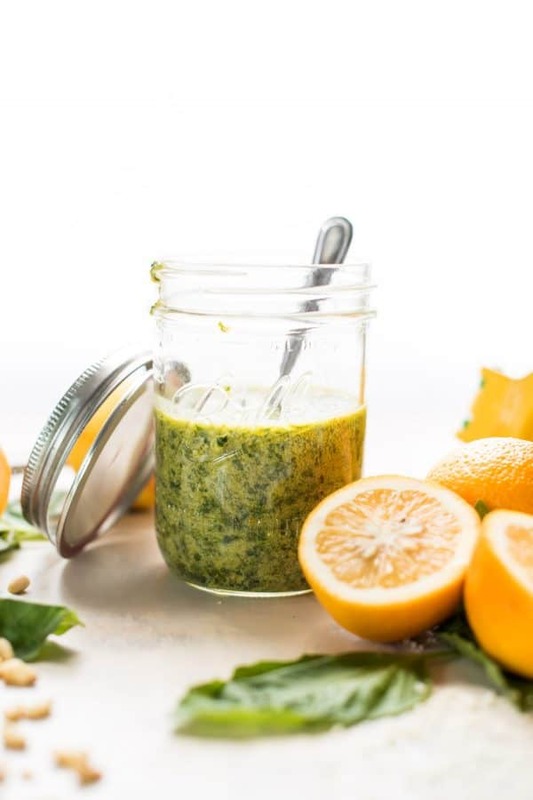 You can definitely still make this Meyer lemon basil pesto with regular lemons. It’ll just have a little more zip and pop! There are roughly 7,000 different ways to make pesto. Ok, maybe that’s not an exact count but there are a lot of different pesto recipes. Last summer I was slathering this Kale & Spinach Pesto all over grilled flatbread pizzas and this Avocado Pesto with Zucchini Noodles is easily one of my favorite healthy, yet filling, meals. Toast the nuts. Personal preference here, but whether you’re using pine nuts, walnuts, or almonds – give them a quick toast in a sauté pan. By warming the nuts, you’ll release some of the fragrance and oils and impart more rich flavors into the sauce. Add liquid in stages. 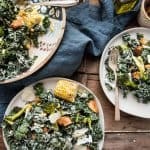 While I personally love to just dump everything in and go, it will help grind up your solid pieces into small bits if you only add a bit of liquid at a time. If you plan on storing your pesto in the refrigerator or freezer, wait to add the cheese. Then add it before you plan on serving it/using it in a sauce. Ready to get your pesto on? Let’s do it! Tell me about your favorite ways to use pesto in the comments! 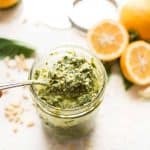 Meyer lemon basil pesto is everything you love about traditional basil pesto with a burst of summery flavors, bright and sweet Meyer lemon, and cheesy Parmesan. Toast: In a small sauté pan, toast the pine nuts over low heat for 3 to 4 minutes. Just until fragrant, slightly browned. 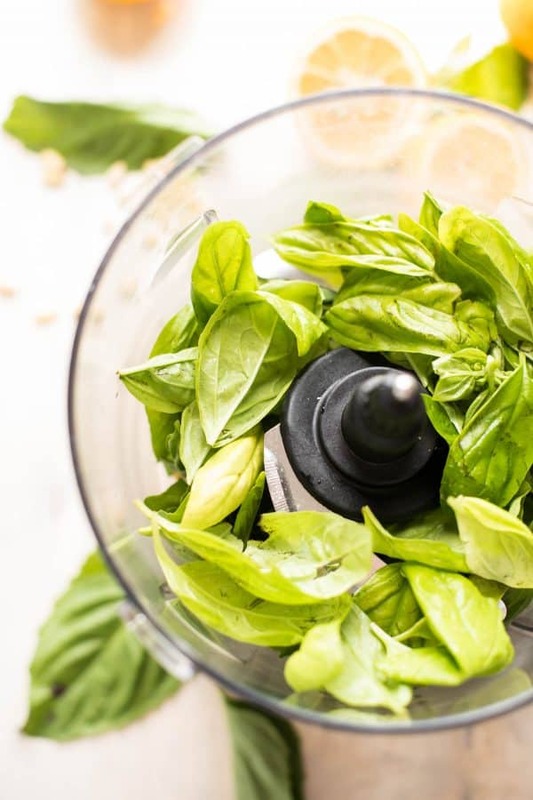 Blend: In a food processor, add the basil, pine nuts, garlic and 1/3 cup olive oil. Pulse 5 to 6 times to break up the ingredients then blend for 1 minutes. Add Meyer lemon zest, juice, salt, and remaining olive oil. Blend for a full minute until combined and oil becomes slightly emulsified. Get Cheesy: If using right away, stir in parmesan cheese. If freezing or storing for later, wait to add the cheese until use. Your photos are so amazing! Pesto is one of my favorites and lemon is such a good addition to it! 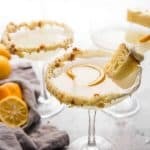 I love Meyer lemons but would have never thought to use them like this! What a great condiment – I’d slather it on soooo many different things. 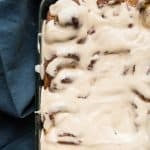 This looks super creamy and delicious. YUM! This sounds so amazing! I love pesto but that fresh pop of lemon must make it even better. You take really great pictures. This would be perfect tossed in fish or pasta! Wow this pesto looks awesome! Homemade pesto is so easy to make, adding this to my must make list! This would be so perfect for a pizza sauce … and some grilled chicken on top! What an awesome way to incorporate that sweet balance into pesto sauce! LOVE it! 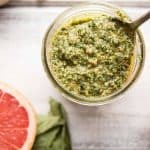 I haven’t seen a pesto recipe lately that has piqued my interest as much as this one! Girl, this looks and sounds like a total home run, and I NEED this in my life right now! I’m going to have to save this until Meyer Lemons are in season, b/c I feel like if It tried to source them now, they’d cost me a million dollars, haha! I want to slather this on literally everything! I love pesto it is so versatile! Your recipe is just perfect. Easy and adding Meyer lemon gives that extra zing that will be so tasty in any recipe! I agree, perfect for pasta! Pesto is one of my all time favorite foods ever! You are so right…there are so many ways to make pesto! I had no idea there was a difference in lemons!! Learn something new everyday!! Oh, wow! Totally loving this fun and unique pesto! Can’t wait to try it! I just made pesto today and am now wishing I had thought to add meyer lemon to it!! Such a fabulous idea! This looks wonderful! 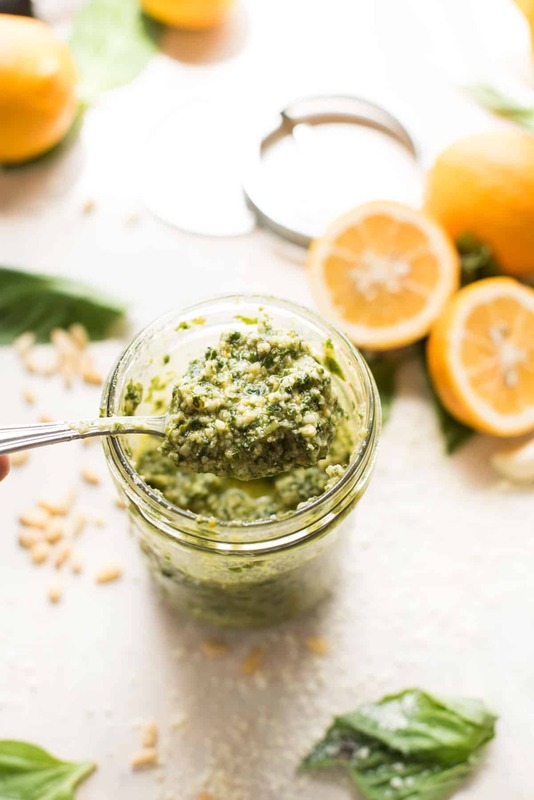 I love the addition of lemon to pesto but would have never thought about making it at home! Whyyyyyy have I never made pesto with meyer lemons. I don’t know. But now I know that I HAVE to ASAP. I’m gonna be spreading this on all of the things. You’re gonna be reeeeaaaal happy about it.